WELT stands for a broad range of print, digital and TV publications. WELT covers all journalistic formats – from news and opinions to documentaries. Every story – whether in text, video, photo or live reports – follows the claim to inform reliably and user-oriented and to inspire our audience equally with passionate journalism, innovative products and the joy of experimentation. WELT Print Total is the new booking unit of WELT Print Working Day (DIE WELT Mon.-Sat.) and WELT AM SONNTAG including Kompakt editions (except Saturday). WELT AM SONNTAG stands for outstanding journalistic competence and inspiration. On the one hand it is very close to the people and their daily life. On the other hand, it frequently presents powerful investigative stories from business and politics. It is the most important Sunday reading matter for sophisticated readers. Surprising background stories, up-to-date analysis, exclusive interviews and entertaining topics with high standards define the editorial spectrum. This also includes analyses and forecasts from the financial sector, exciting sportsnews as well as exclusive reports concerning topics such as style and culture, real estate, travels and engineering. In WELT AM SONNTAG Kompakt the content is arranged in a new way for a young, well-educated and urban taget group. 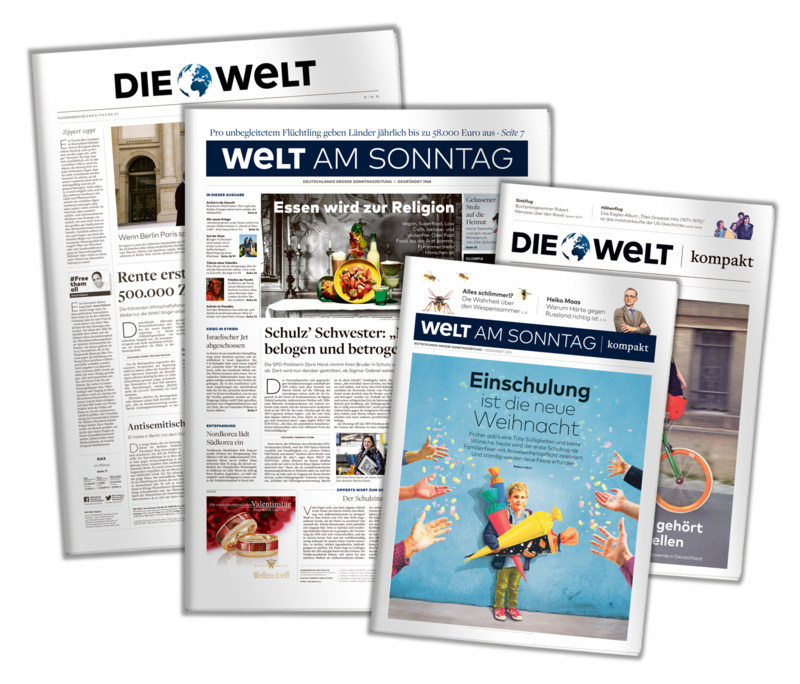 WELT Print Working Day is the new booking unit of DIE WELT (Mon.– Sat.) and DIE WELT Kompact (Mon.– Fri.) as one booking unit with two formats (except Saturday): DIE WELT in nordic format and DIE WELT Compact in tabloid format. DIE WELT – the national daily is one of Europe`s leading newspapers and indispensable for national decision-maker campaigns. DIE WELT focuses on what represents the strength of a modern daily newspaper: the written word. More major topics, researched in greater depth and commented in more detail – newspaper that fulfils today requirements. In the departments of Politics, Business & Finance and Culture, DIE WELT offers clearly structured news, analyses and commentaries. 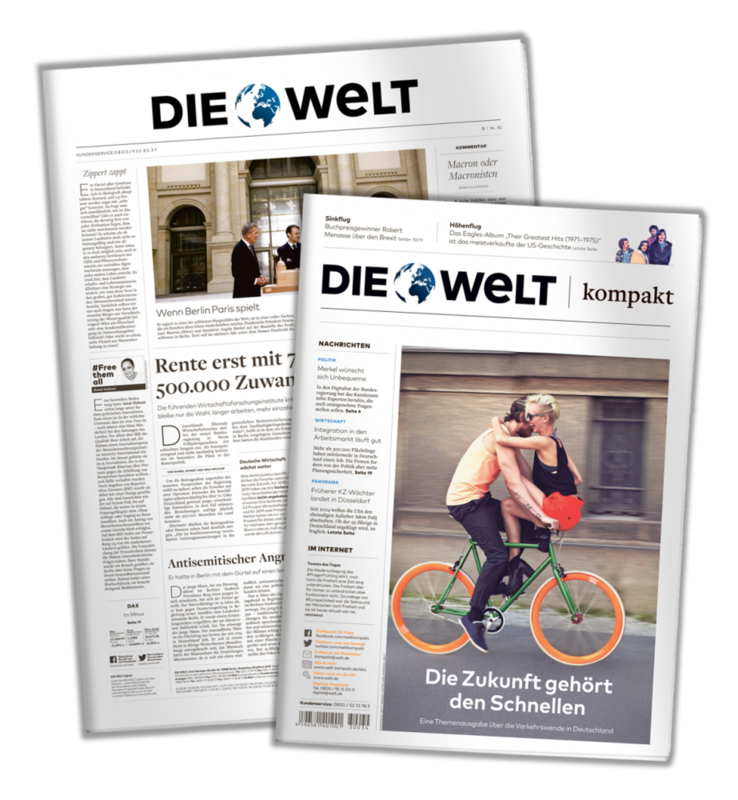 DIE WELT Kompakt, the quality newspaper in the modern tabloid format, is the newspaper for young, urban professionals who want to be efficiently and extensively informed by a daily newspaper.